Do you ever feel your superhero gangster power fantasy just doesn't have enough power? 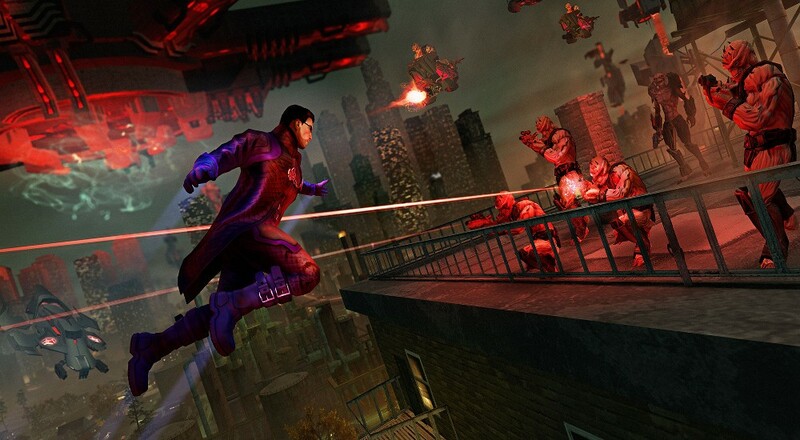 Volition has decided that being able to fly and launch fireballs out of your hands not quite powerful enough, and seek to rectify the issue with the new "Elements of Destruction" DLC pack for Saints Row 4. You and your homies are given a greater arsenal of devastating new abilities to further sweep up the streets of Steelport that all center around the theme of explosions. And in Saints Row, everything is already exploding all the time. First up is an attack similar to your run-of the mill telekinesis with a twist. When you normally hurl someone with your crazy mind powers, they will bounce around for a bit before getting up and either run away in terror or try to fight back. This new ability makes sure they won't lift a finger against you, as by the end of the throw, they straight up explode like a pinata full of nitroglycerin. The second ability cut out the whole "telekinesis" element of the previous one, and transforms some alien / gang member / hoodlum / poor, innocent pedestrian into a walking time bomb for their final few terrifying seconds of life. The resulting explosion damages everything around patient zero, and should be good for clearing out enemies. The next new feature takes the concept of dominoes to a new level. The Explosive Chain Blast makes something explode, and if anything is damaged around it, THAT explodes. It's the kind of chain reaction that would turn any run of the mill traffic jam into the destruction of all life on earth. The final addition to your superhero power list is a the Airstrike Stomp. The Boss stomps the ground, and any adjacent enemies find themselves soaring throughout the air, while a blanket of missiles rains from the heavens. Over the top? Sure, but that's why you go to Saints Row in the first place. It wouldn't be a Saints game without gratuitous explosions and the abandonment of any semblance of realism. "Elements of Destruction" is available now for $3.